I know I'm about a year behind on this, but I think I'm going to make Smooch! The gauge on Cotton Silk Aran seems to be close enough to All Seasons Cotton that I can fudge it with needle size changes, if need be. And I have the advantage of learning from everybody else's experiences last spring. I love my fellow knit-bloggers! *My paternal grandfather was married to a Texan. Despite the fact that she was not my father's mother, she was the only grandmother I even knew on that side of my family. She used to call us to the dinner table for some "mighty fine victuals!" Posted by shannon at March 27, 2004 11:19 PM | For related posts: For Me!, Smooches! 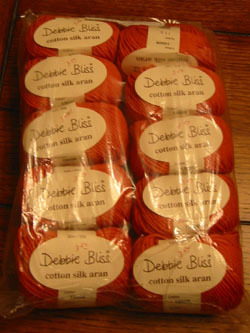 Oooh, lovely new yarn. And it's great to see some Smooches getting planned for this year. Country Weaver's in Austin TX sometime. Despite the name there is a lot of knitting yarn there! I love Smooch. Can't wait to see it knitting up. :) And I think you showed great restraint in not buying more at 50%!